The Master of Business Administration program in Indiana State University's College of Business has one of the highest rankings in the country when it comes to student satisfaction. The program is one of 15 named to The Princeton Review's "Student Opinion Honors for Business Schools" in the general management category. The honors list is one of six categories to appear in the April 2009 issue of Entrepreneur, the nation's leading publication for and about entrepreneurs. MBA students at Indiana State come from a variety of countries, backgrounds, and undergraduate majors including marketing, finance, and engineering. Nearly half are international students. Graduates have gone on to top positions in the business world and succeeded as entrepreneurs and business owners. The ISU MBA program is accredited by AACSB-International (Association to Advance Collegiate Schools of Business) and the North Central Association of Colleges and Secondary Schools. In addition to the student opinion honor, the program has been named a top business school by The Princeton Review for the past three years. "The College of Business is particularly pleased with this recognition from our students. Very positive connections among our MBA students and faculty, as well as quality teaching and administration, lead to a high level of student satisfaction and success of our graduates," said Nancy Merritt, dean of the College of Business. "The MBA experience at ISU is enriched by interactions with industry, international and other study trips, and the diversity of student work experiences, nationalities, and prior areas of study. By graduation, students have formed long-term friendships and business contacts." Created by The Princeton Review, the education services company, the "Student Opinion Honors for Business Schools" are reported in six categories: accounting, finance, general management, global management, marketing and operations. Each list names 15 graduate schools of business most highly rated by their students evaluating their MBA program's preparation in specific categories. 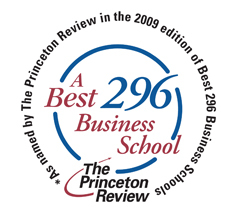 The Princeton Review compiled the lists using data from its national survey of 19,000 MBA students attending 296 business schools profiled in its book, Best 296 Business Schools: 2009 Edition. The 80-question survey asked students to report on classroom and campus experiences at their schools and rate their MBA programs in several areas. The Princeton Review tallied the "Student Opinion Honors" lists based on students' assessments of how well (on a five-point scale) they felt their business school courses had prepared them to succeed in each of the six areas. About The Princeton Review The Princeton Review is an education services company known for its test-prep courses, education programs, admission services, and 165 books published by Random House. Among them are "Best 296 Business Schools" and "Best 174 Law Schools" â€“ each of which includes 11 ranking lists of the top 10 schools in the books in various categories based on institutional data and student surveys. The company also publishes "Best 168 Medical Schools" and "Best 368 Colleges," plus guides for college and graduate school admission exams and other resource books. The Princeton Review is not affiliated with Princeton University and it is not a magazine. About Entrepreneur Media Inc. Entrepreneur Media Inc. is the premier content provider for and about entrepreneurs whose products engage and inspire every day with the advice, solutions and resources that fuel the bold and independent way entrepreneurs think. After 31 years, nobody reaches more growing businesses. As the original magazine for the small and midsize business community, Entrepreneur continues to be the definitive guide to all the diverse challenges of business ownership. Entrepreneur.com is the most widely used website by entrepreneurs and emerging businesses worldwide. Entrepreneur Press publishes the books that turn entrepreneurial skills into business success. More information about the ISU College of Business MBA program is available online. The ISU Master of Business Administration program is named to The Princeton Review's "Student Opinion Honors for Business Schools" in the general management category. The honors list will appear in the April 2009 issue of Entrepreneur magazine.